The U.S. Centers for Medicare & Medicaid Services (CMS) has officially adopted the 2012 edition of NFPA 101: Life Safety Code®. See how health care facility requirements in the 2012 Life Safety Code® differ from those in the 2000 Life Safety Code, and how the latest provisions will impact facility compliance and renovations in the future. 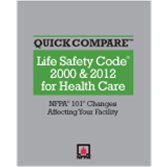 Quick Compare™, Life Safety Code 2000 & 2012 for Health Care: NFPA 101® Changes Affecting Your Facility gives you an in-depth understanding of the changes in order to plan projects, budget appropriately, and be ready for CMS evaluations. Quick Compare gives facility managers, providers, consultants, engineers, architects, surveyors, and AHJs a fast, accessible source for information about the specific Code changes relevant to health care. AHJs and surveyors for CMS and The Joint Commission will have the information required to properly enforce new provisions and assess waivers. (Spiralbound, 400 pp., 2013). View a demo of the online tool for Quick Compare!